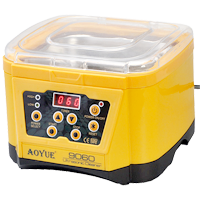 Ultrasonic cleaner Ayoue 9060 110W 1000ml is designed for rinsing wafers, watches, telephones, jewelry, precision equipment for example. 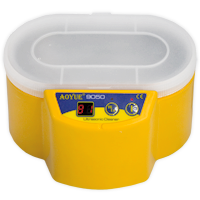 Ideally suited for field service tools and BGA washed in isopropanol (IPA). 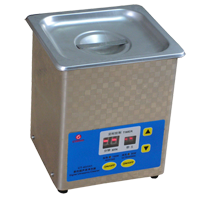 Ultrasonic cleaner Aoyue 9050 30/50W 500ml is a budgetary model with two buttons control and a display of used power (30 / 50W) and working time. Designed for rinsing wafers, watches, telephones, jewelry, precision equipment for example. Ideally suited for field service tools and BGA washed in isopropanol (IPA). EMAG Emmi D130 13 liter ultrasonic heater with heater, time control with continuous mode option, two-stage power control, and additional Degass functions (sweeping of cleaning fluid before proper cleaning) and Sweep (in this mode the washing machine operates at variable frequency, To obtain a uniform distribution of the sound field). 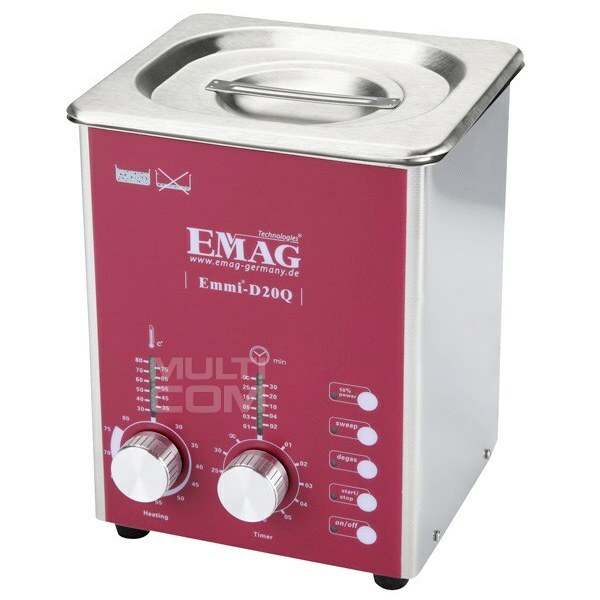 EMAG Emmi D20Q 2 liter ultrasonic heater with heater, time control with continuous mode option, two-stage power control, and additional Degass functions (sweeping of cleaning fluid before proper cleaning) and Sweep (in this mode the washing machine operates at variable frequency, To obtain a uniform distribution of the sound field). 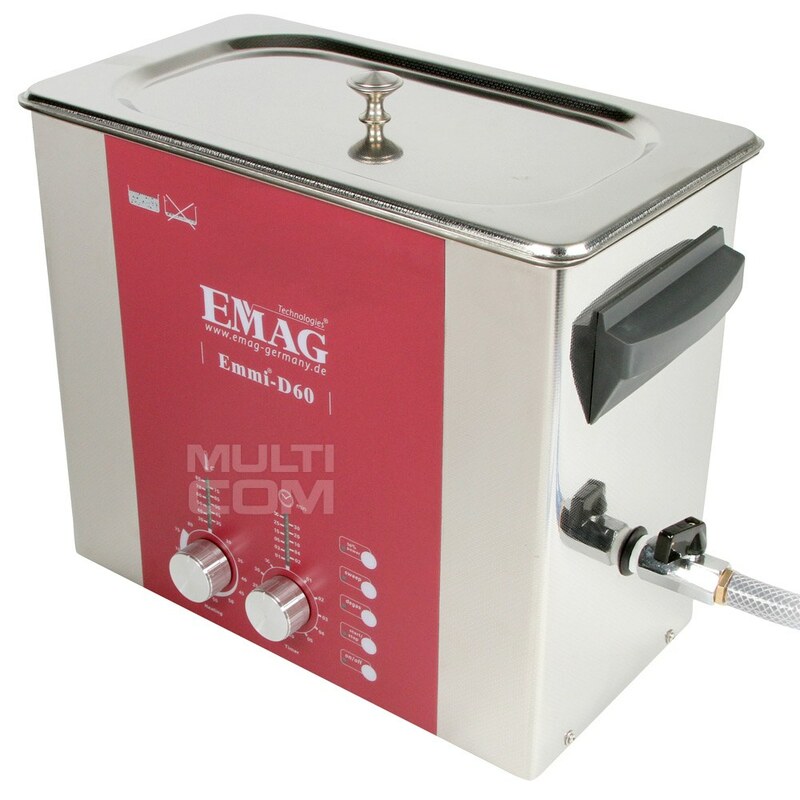 EMAG Emmi D30 3 liter ultrasonic heater with heater, time control with continuous mode option, two-stage power control, and additional Degass functions (sweeping of cleaning fluid before proper cleaning) and Sweep (in this mode the washing machine operates at variable frequency, To obtain a uniform distribution of the sound field). 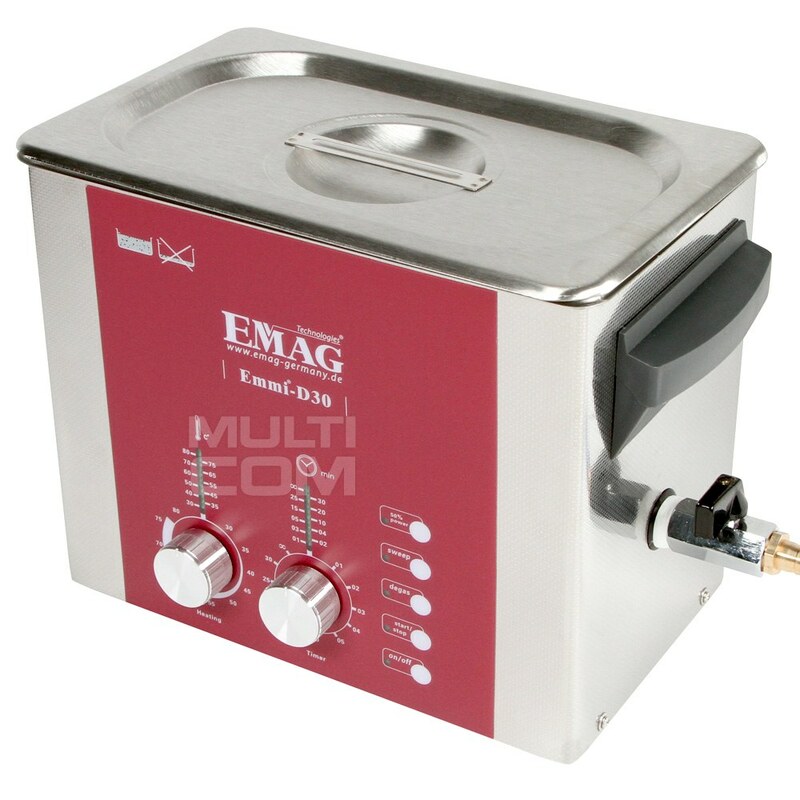 EMAG Emmi D40 4 liter ultrasonic heater with heater, time control with continuous mode option, two-stage power control, and additional Degass functions (sweeping of cleaning fluid before proper cleaning) and Sweep (in this mode the washing machine operates at variable frequency, To obtain a uniform distribution of the sound field). 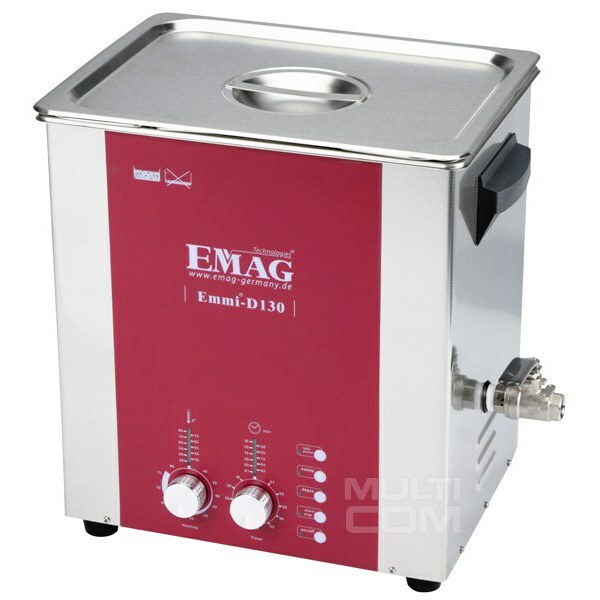 EMAG Emmi D60 6 liter ultrasonic heater with heater, time control with continuous mode option, two-stage power control, and additional Degass functions (sweeping of cleaning fluid before proper cleaning) and Sweep (in this mode the washing machine operates at variable frequency, To obtain a uniform distribution of the sound field). 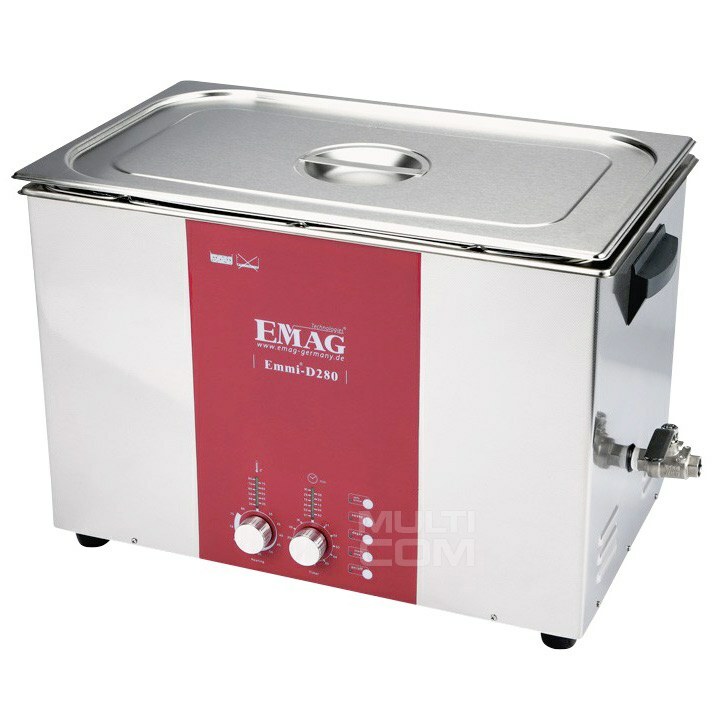 EMAG Emmi H120 12 liters ultrasonic cleaner with time-adjusting function and pre-heating of cleaning fluid. The pump is equipped with an analogue cleaning time adjustment of 1-60 minutes and heating with temperature control from 20 to 80 degrees. 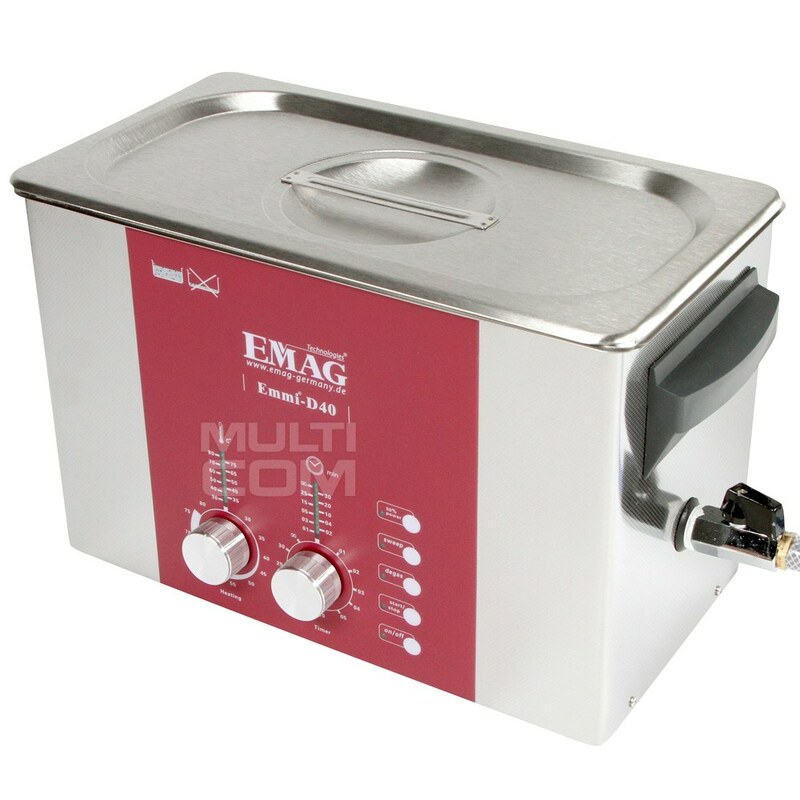 EMAG Emmi H22 2,2 liters ultrasonic cleaner with time-adjusting function and pre-heating of cleaning fluid. The pump is equipped with an analogue cleaning time adjustment of 1-60 minutes and heating with temperature control from 20 to 80 degrees. 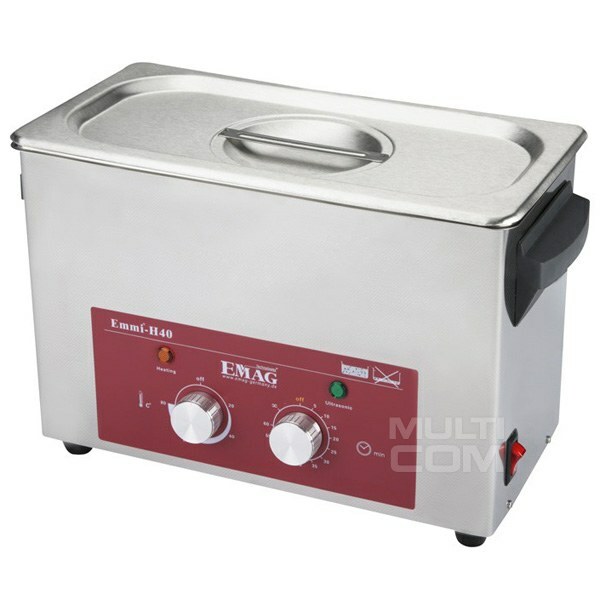 EMAG Emmi H30 3 liters ultrasonic cleaner with time-adjusting function and pre-heating of cleaning fluid. The pump is equipped with an analogue cleaning time adjustment of 1-60 minutes and heating with temperature control from 20 to 80 degrees. 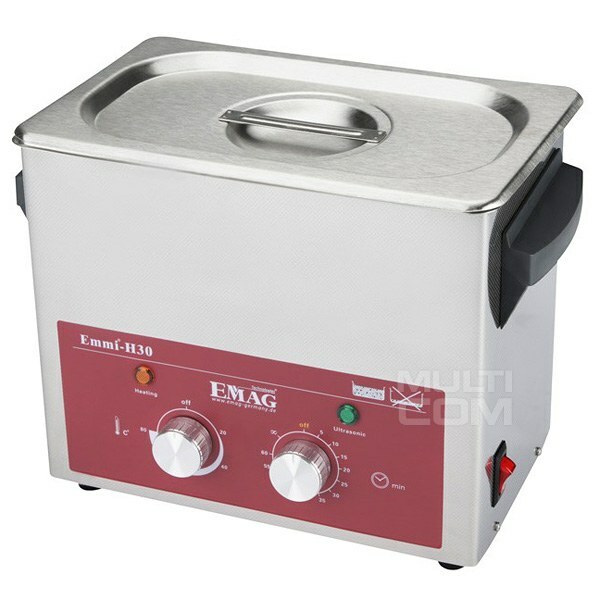 EMAG Emmi H40 4 liters ultrasonic cleaner with time-adjusting function and pre-heating of cleaning fluid. The pump is equipped with an analogue cleaning time adjustment of 1-60 minutes and heating with temperature control from 20 to 80 degrees. 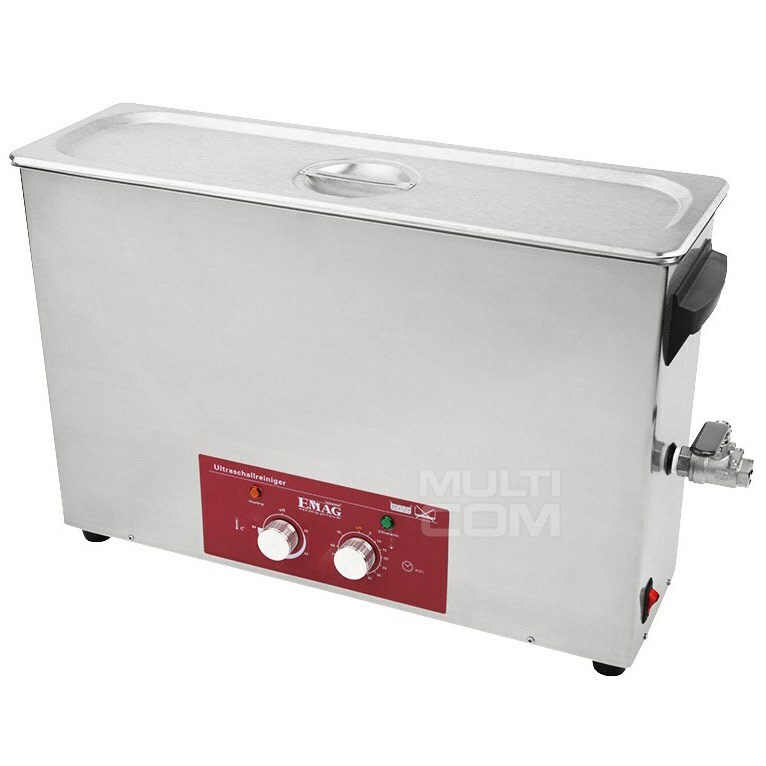 EMAG Emmi H60 6 liters ultrasonic cleaner with time-adjusting function and pre-heating of cleaning fluid. The pump is equipped with an analogue cleaning time adjustment of 1-60 minutes and heating with temperature control from 20 to 80 degrees. 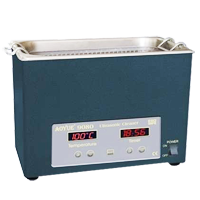 Ultrasonic cleaner Aoyue 9080 4000ml 120W is a digitally controlled Bath has displays including the current temperature of the liquid and the timing of work. 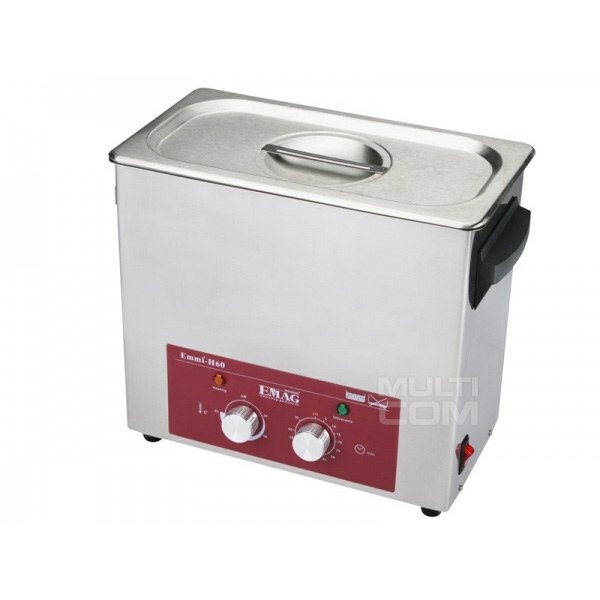 Ultrasonic Cleaner CT-431H1 50W Adopts micro-computer control and cleaning time can be set within a wide range. Sealed control panel, water proof and damp proof. Built-in PTC heating unit for heating the cleaning liquid for better cleaning effect. PTC heating is controlled by separated switch, easy to operate and fits for small articles cleaning. The product is made of high quality stainless steel, corrosion proof and with a long using life.